Originally for piano four-hands, and there is also a version for orchestra. 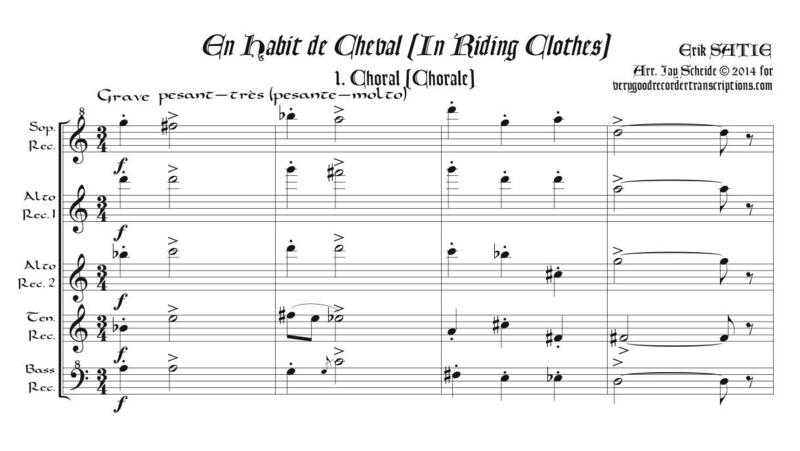 Title means, “In Riding Clothes.” The first mvmt., “Choral” (Chorale) is arranged for soprano, two altos, tenor and bass; the second and third, “Fugue Litanique,” (Litanical Fugue) and “Autre Choral” (Another Chorale) for soprano, alto, tenor, and two basses; and the fourth mvmt., “Fugue de Papier” (Paper Fugue), for sopranino, soprano, alto, tenor, and bass. If there are not enough players who can switch between the prescribed instruments, an alternative which might work would be to have one person play alto in #1, bass in #2 & 3, and sopranino in #4, and the others stick to the same instruments throughout: S, A, T, and B. This arrangement would require deciding which of the two alto parts the roving player would play in #1, and which of the two bass parts they would play in #2 & 3. In summary: 1st mvmt. SAATB, 2nd SATBB, 3rd SATBB, 4th S’inoSATB. Score and parts.